This decadent cookie is based on the 1,000 Layer Chocolate Chip Cookie made famous by Martha Stewart. 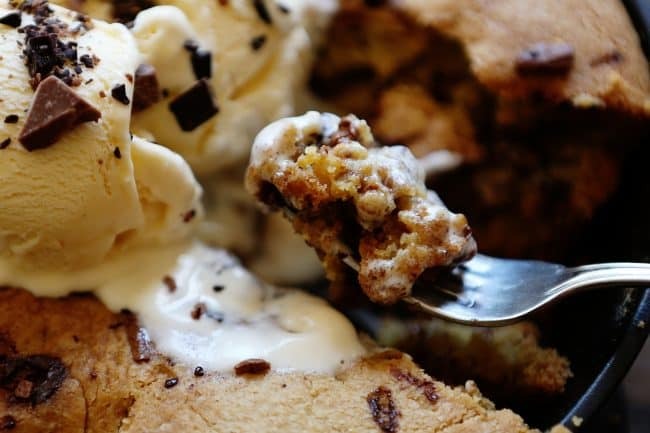 A few little tweaks and it becomes a skillet cookie to top all skillet cookies! 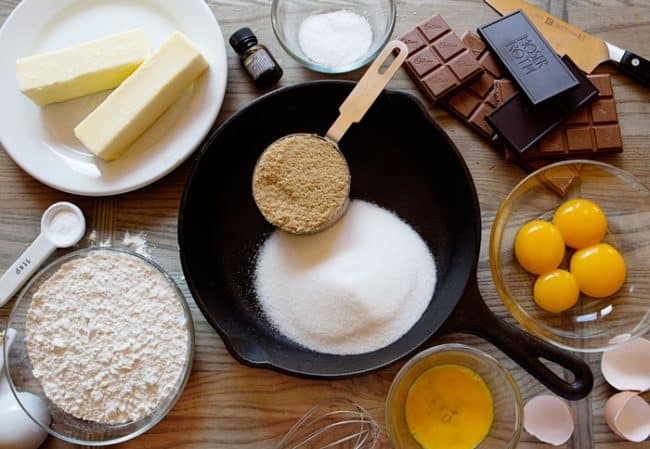 Begin by preparing the cookie recipe as directed. Do not skip on the cooling time! Cooling the cookie dough is essential in creating the intense depth of flavor. The recipe recommends 30 minutes, but you can chill as long as 3 days. When the dough is ready, place it on a solid surface dusted with flour. Remove plastic wrap and roll out the first layer to approximately 1/2 inch thickness. Roll out next section of dough and set aside. (I like to separate my layers with parchment paper.) 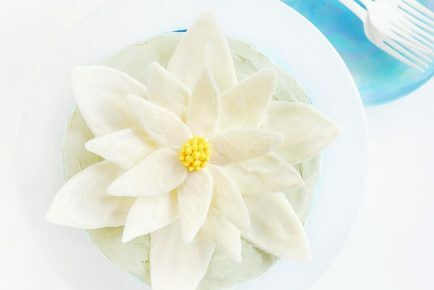 You may need to add more flour to your surface. Roll out the last layer of cookie dough. Cover one cookie dough layer with 1/2 of your chopped chocolate. Place the next layer of cookie dough directly on top of it and press down. Cover with most of your remaining chopped chocolate. 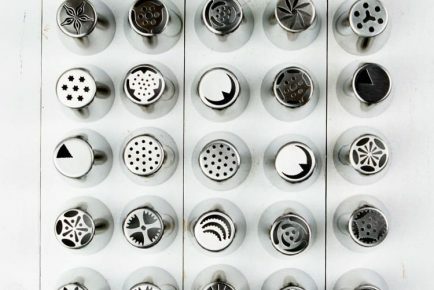 (Reserve a small portion for sprinkling.) Place the final layer of cookie dough on top and roll flat with rolling pin. 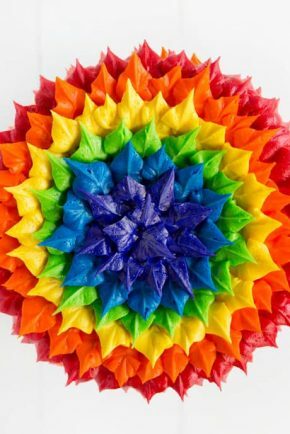 You can fold this dough over and continue rolling as many times as you would like. You can also separate the dough into more sections (like 6) and do more layers. Just be sure to have more chocolate on hand! 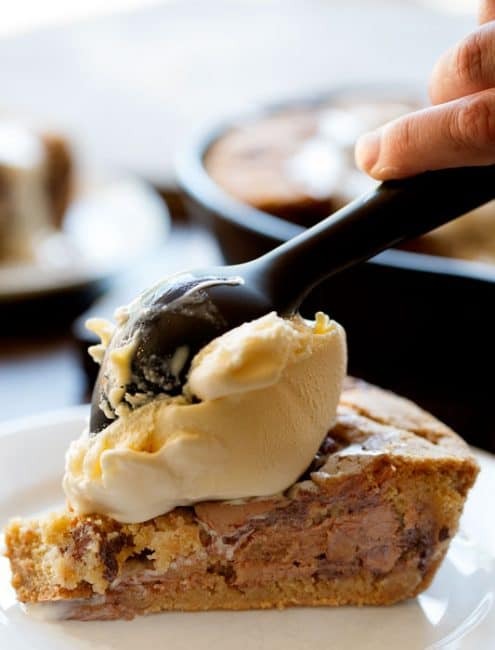 Using your hands, form the layers of cookie dough into a shape that will fit into your skillet. My skillet was 7-inches, but you can use an 8-inch, 9-inch, or even a 12-inch skillet. Using a small pizza peel or a large cake server, gently move the cookie dough to your prepared skillet. Bake as directed. When the cookie is done baking, remove from oven and let it rest for a couple minutes. Cover with vanilla ice cream and sprinkle with remaining chocolate bits. 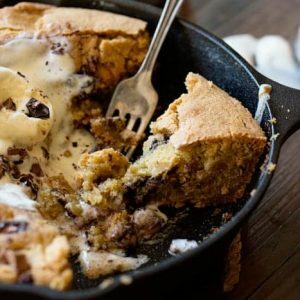 The absolute best possible way to consume this cookie skillet is to grab a fork and dig in! In addition to this being the best tasting chocolate chip cookie you will ever have, you will be creating a lifetime of memories with your loved ones! 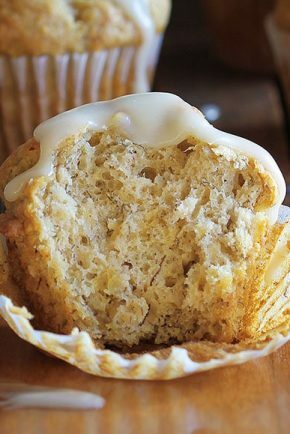 In a large bowl, cream together butter and both sugars on medium-high speed until light and fluffy, about 3 minutes. Beat in egg yolks and mix until combined. With hand-held mixer off, add in vanilla. Set aside. With the mixer on low, add flour mixture to butter mixture; mix until just combined. Scrape down sides of bowl and mix to combine. Divide dough into three equal portions. 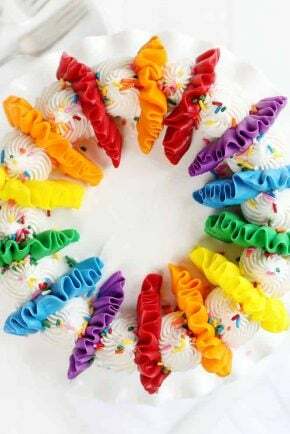 Wrap each portion with plastic wrap and transfer to refrigerator; let chill for 30 minutes. Meanwhile, coarsely chop chocolate into thin shards. Set aside. 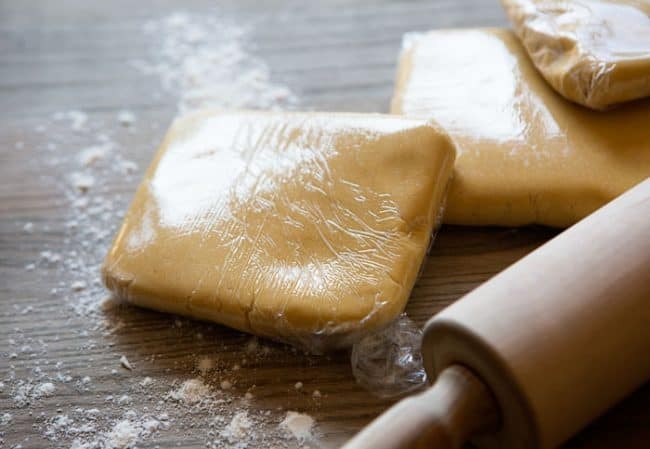 Unwrap each portion of chilled dough and place on a lightly floured work surface. Roll approximately 1/2 inch thick. Sprinkle with half the chocolate and top of a second portion of chilled dough. Sprinkle with remaining chocolate and top with remaining portion of dough. Gently flatten with rolling pin. Prepare a 7-inch cast iron skillet with baking spray. Carefully move cookie down to skillet. Bake until cookie is set, 30-36 minutes, at 350°F. Remove from oven and allow to cool just slightly for about 3 minutes. 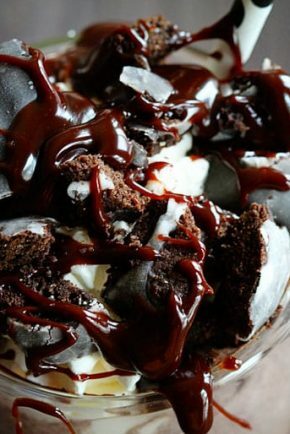 Add ice cream and sprinkle with remaining chopped chocolate. Ooh Amanda! 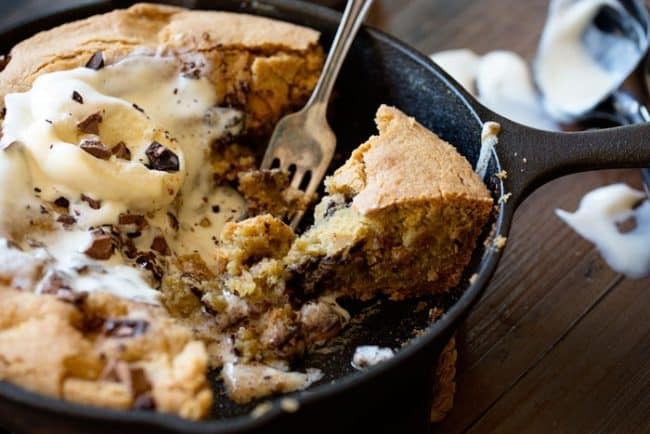 The cookie skillet looks delicious!!! I’m gonna try it as soon as i can! And…i found out with your video that you have a Little Olivia… Just like me!!!! ???? Deliciously great!love to try it! great recipes thank you so much..